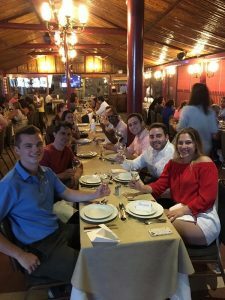 After a week of travel, construction site visits, and industry lectures the global leaders were able to unwind and enjoy a night at Los Buenos Muchachos. It is located in the Region Metropolitana in Santiago, Chile. Los Buenos Muchachos dates back to 1939 when it was founded by Jose Ignacio Vivanco Parada at the age of 17. Over time his family grew the business until it reached its modern size. The night began with a glass of pisco sour, a classic Chilean drink. Throughout the evening we shared delicious family style platters of traditional Chilean cuisine. Crab, shrimp, fish, and vegetables were served along with bread as an appetizer. This was followed by a steaming platter of beef, prepared in a variety of ways. We shared red wine throughout our meal. Our last night in Chile was full of laughter and lots of fun. 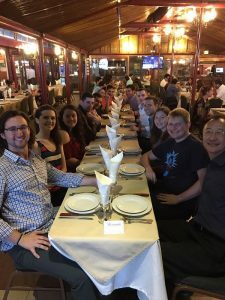 Both classes of global leaders sat together at banquet tables. As a whole the global leaders bonded over the course of the past week. We were a much closer group than we were when the trip began. 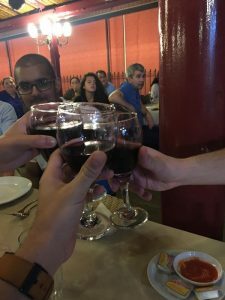 This transition was very evident during the trip and certainly showed at our closing dinner. 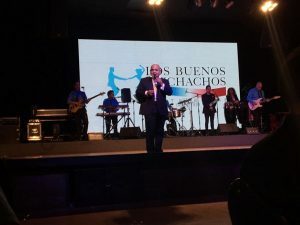 While we enjoyed our food we were treated to live Chilean music from the house band. Intermittently our host shared historic information about his country’s past. Dancers performed traditional dances throughout the night. Men and women demonstrated important parts of their Chilean culture. 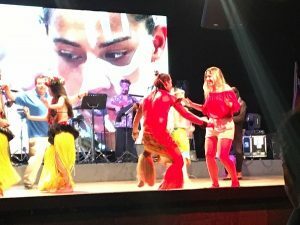 We learned about Chile’s connection to Easter Island and watched the dancers perform traditional dances from the Island. As the night came to a close two of our own global leaders were invited up on stage and took the opportunity to have a part in an Easter Island Dance. After dinner and the show came to an end the dance floor was opened up. 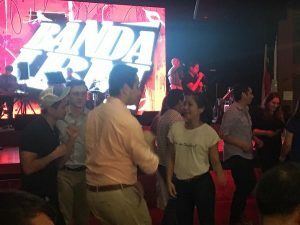 The global leaders quickly took to the floor to dance together. It was easy to see how well the group clicked as they celebrated the night, even Professor Liu!